As the Notre-Dame Cathedral was struck by a devastating fire on Monday, a new YouTube feature in the US and South Korea displayed an information panel related the September 11 terror attacks. YouTube’s panels are meant to combat misinformation and conspiracy theories by linking to verified sources on trending news subjects. The information panels were automatically triggered as the fire at Notre-Dame Cathedral captured global attention; YouTube says it has disabled the panels for live streams related to the fire. A YouTube feature designed to stop the spread of misinformation became a major source of confusion on Monday. 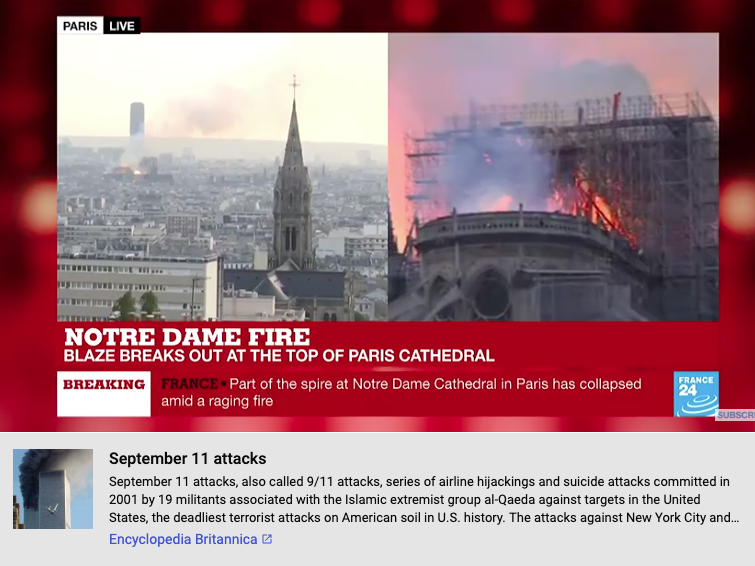 Multiple YouTube viewers tracking the devastating fire at the Notre-Dame Cathedral in Paris reported that live streams and news videos were displaying an information panel related to the September 11 terror attacks in the US. YouTube’s algorithm automatically determines when a subject is trending news and attaches an information panel automatically. The information panel feature is only available in the US and South Korea as of now, and is meant to provide news from verified sources and counter videos that share conspiracy theories and false narratives.